UDAYAPUR, March 26: Of late, thousands of hectares of forest along the Chure Range in Udayapur district have been destroyed by forest fires. Community forests in the eastern side of the district are the most affected. 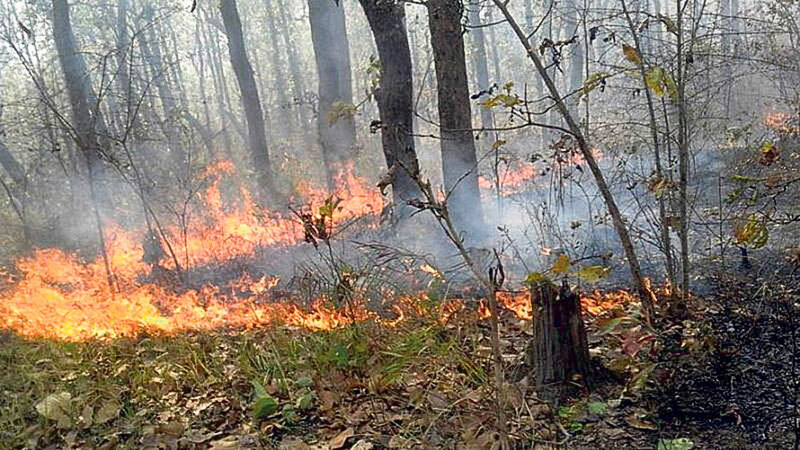 Community forests in the north of the district headquarters, including Babari, Jalpadevi, Nawaudaya, Chappan and Hariyali among others have been destroyed by the fires. “When I saw the forest on Saturday, there still were greeneries. However, the next day many parts of the forests were destroyed by fire,” added Rai. Locals said that hundreds of hectares of forest in Katari Municipality ward 1, 6 and 7 have already been destroyed by fires. Mayor Gyanendra Shrestha of Katari Municipality also acknowledged the impact of forest fire in the region. “In areas where fire brigades can reach, fires have been taken under control. However, the sector forest offices did not try to douse the fire in their areas inaccessible for fire brigade,” said the mayor. Mayor Shrestha also urged the locals to stay alert stating that there is a high risk of forest fires spreading to the settlements as well. District Forest Officer Bishnu Prasad Bhandari said they are adopting various measures to prevent forest fires. “I have already alerted the employees at the forest office and community forest groups to adopt alertness to prevent forest fires,” he said. Assistant Forest Officer Jageshwar Shah said forest fires have become uncontrolled after the rise in temperature and strong winds. “Although we have received reports of forest fires from many areas, we are yet to determine how many hectares of forest have been affected,” he said. Udayapur has been losing lots of forest areas to unchecked smuggling and fires despite calls from the local communities to take concrete measures to protect the forests.